Andrew Weil, the world famous champion of holistic health having been named by Forbes as one of the most widely-known and respected alternative medicine gurus and by Time as one of the 25 most influential Americans came to see me. Dr. Andrew Weil was in pain. For Andy, MRIs revealed advanced-stage arthritis in his right knee, and no amount of medication was alleviating his pain. He tried many complimentary methods with minimal relief; finally consulting allopathic approach. Doctors told Andy he had to lose significant weight to relieve the pressure on his knee—though, ultimately, they recommended a total knee replacement if he wanted to be pain-free again. Andy had been caught up in a framework that focuses on treating pain as being broken and something to be fixed, rather than a signal to be calibrated and tuned. Yes Andy had arthritis, but Andy’s real problem—like millions who suffer from various chronic pain conditions—was a bilateral body out of balance. From how he held his head to the way he crossed his arms, even to how he smiled, I could tell Andy’s right side had excessive tension from head to toe that was not evident on his left side. His tentative steps revealed just how much stress this behavior was placing on his afflicted right knee. In his case, that meant he lacked a dynamic balance of tension in his myofascial system, both left and right. I taught him two simple stretches for his right knee and showed him how to keep his right knee unlocked both standing and sitting. We were creating a dynamic balance, bilaterally, where the tension was now the same on both sides. After Andy realized that he had been in the habit of using one side of his body all the time, he was then able to change those behaviors as simply as going from Monday to Tuesday. I did not fix his arthitis; he did not instantly lose weight. For Andy, it only took two sessions learn how to achieve a dynamic balance because he cultivated his body behaviors bilaterally. 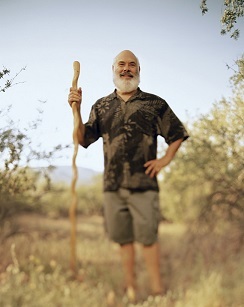 Andy wasn’t ‘broken” and today, at 75, he routinely hikes in the mountains of Arizona—all with zero pain.